In Albert-Émile Artigue’s Fleurs de Printemps, blossoms abound in a lush river landscape dotted with blooming trees in springtime. 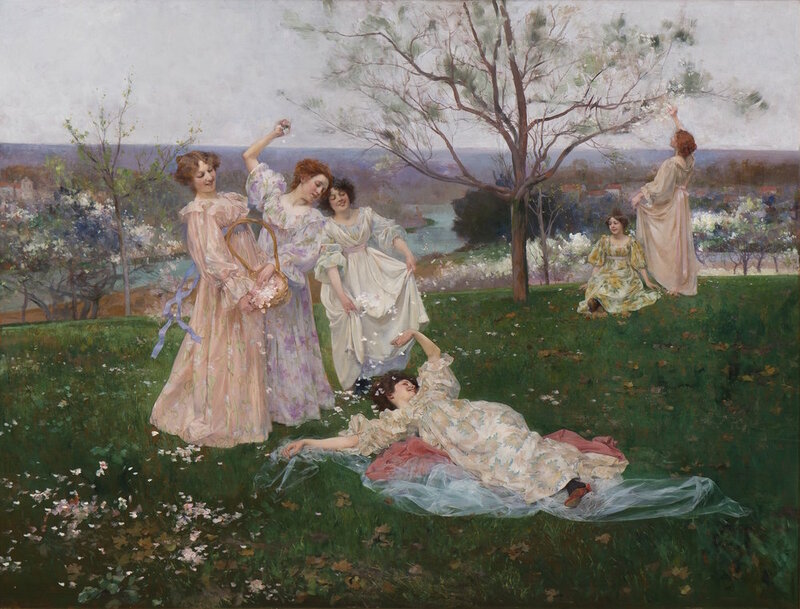 Having stripped the nearest tree of its petals, the frolicking of six young women have begun to wind down, as exemplified by the prone beauty of the foreground. The perfection of the day is matched only by the loveliness of the portrayed ladies. Their floral-patterned tea dresses serve to underscore the point of the title’s double entendre. When unveiled at the Salon in 1897, Fleurs de Printemps proved an instant success with the press and public alike. The importance of exhibiting at the Salons in Paris at this time cannot be overstated. The Salons set the standards for the art market not only in France but throughout the entire Western world, and from 1848–1898 it was at the peak of its power. Thousands of paintings were hung at each Salon, creating the largest exhibition of contemporary art in the world. Thousands poured into Paris to attend the Salon, with years that had 500,000 visitors not unusual. The public regarded painters whose work had been accepted by the Salon as worthy of purchase, with the exact opposite being true for those whose paintings had been rejected. Undoubtedly an artist’s submission to the Salon was agonized over, with only his best work sent, as each time the future success of his career was at stake. Whereas most artists did not dare hope for more than inclusion in the Salon, to be singled out by the press from the 1,776 paintings as well as the total 4,322 art objects on view in 1897 was a phenomenal achievement. The official guide to the Salon was the Explication des Ouvrages de Peintre, Sculpture, Architecture, Gravure et Lithographie des Artistes Vivants, published on April 20, 1897, for the opening, which duly listed all of the works on exhibition, but provided no further assistance. In a virtual sea of objects and crowds, visitors sought guidance to the highlights not to be missed. This need was met by numerous handbooks, often illustrated, that picked out the choicest works. Further, continuous reviews appeared in the press throughout the run of the Salon, recording favorites. Artigue must have been highly gratified to have had Fleurs de Printemps illustrated and noted not only in numerous French publications, but those targeting English, American, and Spanish audiences, as well. Prints of works that proved popular at the Salons were sold as souvenirs and collectibles, as well as regarded as perfect holiday or wedding gifts. The esteemed firm of Goupil & Cie had a highly successful business of not only selling original works but also the prints and photographs after them. Carefully choosing works that “sparked discussion” and “prompted reviews,” Goupil sold prints in various price brackets, so that almost anyone could afford to own a version of a famous Salon painting. In addition to the prints, Goupil produced beautiful large albums of photogravures after the most popular paintings for that year. For visitors to the Salon of 1897, Goupil published two different books in which Artigue’s Fleurs de Printemps was applauded and illustrated—Le Salon de 1897 and Goupil’s Paris Salon of 1897, One Hundred Plates – Photogravures and Etchings, with one obviously aimed at their French-speaking clients and the latter for the English and Americans. A surviving print of Fleurs de Printemps is in the Witt Library Print Collection of the Courtauld Institute of Art, London. In describing Fleurs de Printemps, reviewers such as Gaston Scheffer wrote: “Temptresses, too, those young girls of the Spring Flowers, by Artigue playing with flowers in an orchard, snowed with petals,” which essentially expressed the conventional journalistic response to a painting of a bevy of beauties. Yet, savvy viewers would have recognized a more modern subtext on display. None of this would have been lost on Artigue, as like many of his contemporaries such as Henri de Toulouse-Lautrec and Georges Seurat, he also executed advertising posters. In Fleur de Printemps, these new themes reverberate. Freed from the artists’ of yesteryear’s goddess-like poses intended for the worship of women; Artigue’s subjects engage in a hijinks romp solely for their own pleasure. All pretense of ladylike behavior has at least temporarily been dropped. Even their dress is reflective of a newfound freedom, as tea gowns required a minimal amount of corseting and were regarded as perfect for the outdoors in warm weather. The setting is further reflective of the new mobility afforded by France’s expanded railway network, which reduced travel time in a period of rising prosperity, making a daytrip to the countryside a now possible reality for a population of city-dwellers. At its heart, Fleurs de Printemps is a portrayal of modern women engaged in contemporary life. Artigue was born in Buenos Aires, the son of French parents. His father was Federico Artigue, a painter and photographer. By the age of 15, Albert Émile-Artigue was living in France, and would begin his studies at the École Régionale des Beaux-Arts in Bordeaux. He would complete his training in Paris, and most importantly study with Alexandre Cabanel. His paintings predominantly featured women of the Belle Époque, themes of which continued in his engravings, lithographs, and posters. He exhibited regularly at the Salon from 1875 until 1901, as well as in Munich in 1900. By the early 1900s, Artigue had returned to Argentina, and was teaching at the Academia Nacional Beaux-Arts in Buenos Aires. Confusingly, in Argentina he called himself Emilio Artigue. In 1904, he exhibited as Emilio Artigue in the Argentinian section of The Louisiana Purchase Exposition in St. Louis, where he won a silver medal. Although there were return trips to France, the remainder of his career would be spent in Buenos Aires. His works formed part of the permanent collection of the museums of Baltimore, Bremen, Brest, Buenos Aires, Cordoba, London, New York (The Metropolitan Museum of Art and New York Historical Society), Ottawa, Paris, Philadelphia, and Rosario. Of all the known works by Artigue, Fleur de Printemps must be regarded as his masterpiece. Given its popularity and numerous reproductions, one would have assumed that Artigue’s fame was assured. Yet, only shortly thereafter, he would be gone. There are no records of what spurred such a decision, and why once in Buenos Aires he would further cut ties to Paris and his former reputation by now working as an Argentinian artist named Emilio. Possibly, a clue lies in the fact that in Europe he was often referred to as a South American artist, regardless of his French heritage, and perhaps in the end this became too much of an obstacle for the advancement of his career. Unfortunately, but hardly surprisingly, after his departure, his reputation in Europe and America fell into obscurity. After a lapse of 121 years, the reemergence of Fleurs de Printemps should dispel all ambiguity surrounding Artigue’s talent and worth. Gerald M. Ackerman, “The Glory and Decline of a Great Institution” in French Salon Paintings from Southern Collections, The High Museum of Art, Atlanta, Georgia, January 21 – March 3, 1983, pp. 8-9, 12, 18-19. The Nation, volume XLVII, The Evening Post Publishing Company, New York, 1888, p. 4, an advertisement “Holiday and Wedding Presents that are sure to please”. Mayken Jonkman, “Frederick Hendrik Kaemmerer, The Darling of the Art Market” in The Dutch in Paris 1789–1914, exhibition catalog, Van Gogh Museum, Amsterdam, October 13, 2017 – January 7, 2018, and traveling to Petit Palais, Musée des Beaux-Arts de la Ville de Paris, February 6 – May 13, 2018, p. 140. Gaston Scheffer, Goupil’s Paris Salon of 1897, op. cit., p. 14. Anna D’Souza and Tom McDonough, “Introduction” in The Invisible Flâneuse, Gender, Public Space, and Visual Culture in Nineteenth Century Paris, Manchester University Press, Manchester, 2006, p. 2. Diana Holmes and Carrie Tarr, A Belle Epoque? Women and Feminism in French Society and Culture 1890–1914, Berghahn Books, New York, 2006, pp. 4, 11. Dolores Monet, “Women’s Fashion of the 1890s,” on bellatory.com, August 1, 2017. Diana Holmes and Carrie Tarr, Ibid., p. 11. Biographical information taken from H. Vollmer, Thieme-Becker, op. cit., p. 164; E. Benezit, “Albert-Émile Artigue” in Dictionnaire des Peintres, Sculpteurs, Dessinateurs et Graveurs, Libraire Gründ, Paris, volume I, 1976, p. 283; and Majang Hartwig-Kramer, Allgemeines Kunstlerlexikon, op. cit..
 “Some New Etchings” in The Pall Mall Budget, no. 753, volume XXIX, March 2, 1883, p. 7.